I wanted to read a book by Orhan Pamuk, who won the Noble Prize for Literature in 2006, but when I looked at his recent novels, I was put off. My Name is Red is 688 pages; A Strangeness in my Mind is 764 pages. To me, this seems a disproportionate amount to time to devote to one author. (Perhaps, I’m like a teenage boy: so many girls, so little time.) So, I chose Istanbul: Memories and the City (336 pages), which was written in 2005, and appealed to me because I visited Istanbul, briefly, on my honeymoon. 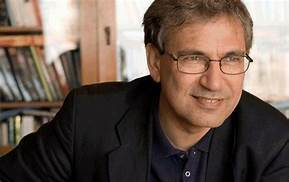 Orhan Pamuk is a Turkish writer, screenwriter and academic, born in Istanbul in 1952; he has sold 13 million books in 63 languages. He is a Professor of Humanities at Columbia University, where he teaches courses in writing and comparative literature. In 2005, Pamuk made a statement regarding the Armenian Genocide that “Thirty thousand Kurds have been killed here, and a million Armenians. And almost nobody dares to mention that. So I do.” An ultra-nationalist lawyer brought a law suit based on Article 301 of the Turkish Penal Code which makes it a crime to insult Turkey or the Turkish Grand National Assembly. The suit resulted in a lengthy battle with the Turkish legals system in which the European Union took an interest because of its implications for the freedom of speech in Turkey. The Turkish Justice Ministry finally declined to back the trial on a technicality, but gave no support to Pamuk, who said that he mentioned the genocide not to call attention to specific numbers of deaths but to demonstrate the lack of freedom to discuss taboo subjects in Turkey. Istanbul, translated by Maureen Freely, is one of five non-fiction works by Pamuk in English. It is, as the subtitle suggests, a reflection on the Istanbul the author knew as a child together with his family memories. There are black-and-white photographs on every couple of pages, some dating back to the mid-nineteenth century, and some as recent at the 1960’s; most are of ‘old Istanbul’ but there are family photographs, as well. The ‘old Istanbul’ photographs are a vehicle for commentary on the writings of European and Turkish literati regarding the culture, style, history, art and visual perspectives of the city. Clearly, Istanbul was (and is) a unique city: its rapid growth, its human crossroads of East and West, its unique wooden architecture (which frequently went up in smoke), the presence of the Bosporus with all its maritime energy, and the air of melancholy (húzún) arising from the dissolution of the Ottoman Empire, the subsequent economic decline, and the cultural ambivalence between East and West. Perhaps what is surprising about this book – part travelogue, history, autobiography, artistic and cultural commentary – is that it is an integral whole, seamlessly shifting themes without confusing the reader. This, I think, is all down to Pamuk’s fondness for his city and his skill as a commentator and a writer. One can set the book aside for a day or two, but one is drawn back into its dream-like flow. The attraction is, in large measure, due to the characterisation of the boy, Orhan, his brother, his mother and father, the larger family and their declining circumstances. The one criticism I have is that a map of the city should have been included. There are frequent references to districts in Istanbul by their Turkish names, but one has no idea of the geography which is an omission for a piece of writing which is otherwise so visual. Istambul is a very pleasant reading experience. 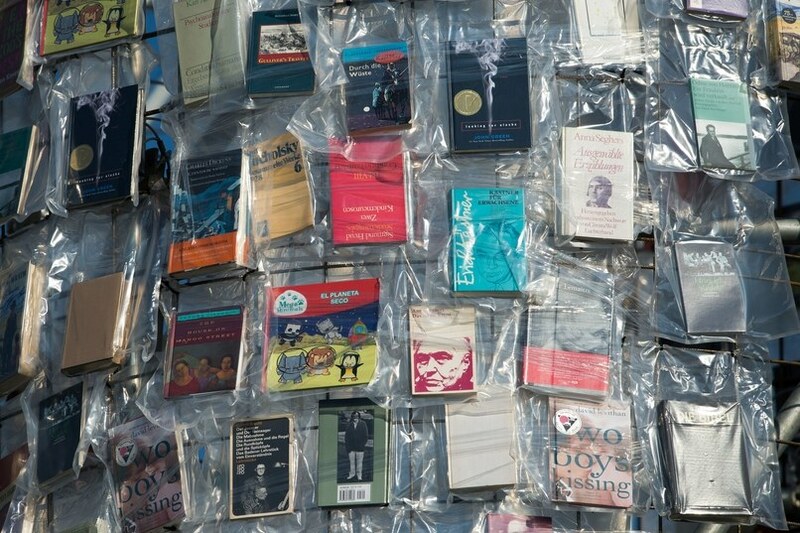 There is an article in Architectural Digest, posted on July 11 by Nick Mafi , the title – 100,000 Banned Books Have Been Formed into a ‘Parthenon of Books – of which caught my eye. 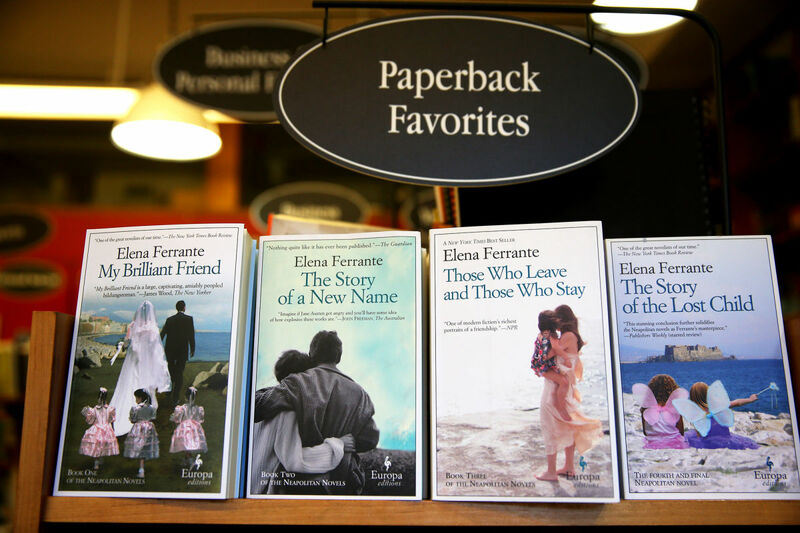 “In the 1930s and 1940s, the Nazis banned books that were written by authors who were of Jewish descent, or had pacifist or communist sympathies. The list included such luminaries as Marcel Proust, Ernest Hemingway, and Jack London. Now, some eight decades later, a monument is being constructed in honour of these censored books. The display is part of the Documenta 14 art festival in Kassel, Germany. Now in its 14th iteration, the Documenta was first established in 1955 an attempt to bring Germany up to speed with modern art, after the horrific years of Nazism. For the current exhibition, Minujín created the structure by sourcing 100,000 donated books from around the world. The novels were then secured to the steel structure with plastic sheeting, protecting them from the natural elements while allowing sunlight to filter through the building. 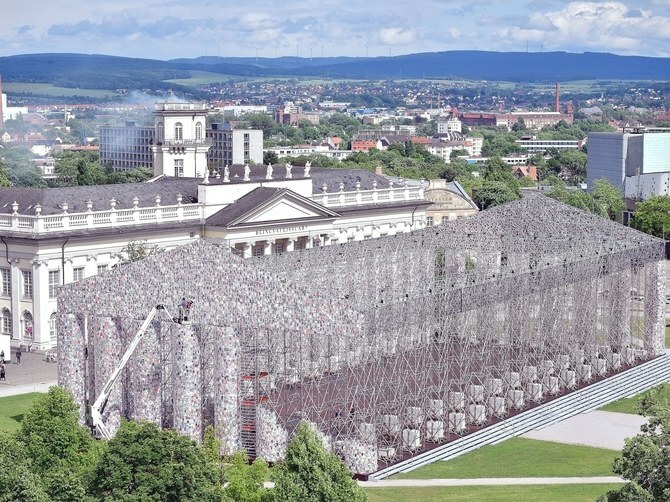 The site of the exhibition is noteworthy as well, as the city of Kassel (located in central Germany) was where several thousand books were burned during the Nazi-led campaign to rid the country of books deemed un-German. “Suppression of freedom of speech in universities is ‘one of the greatest problems of our time’, a former chancellor has warned. (A chancellor in the UK government is the finance minister.) 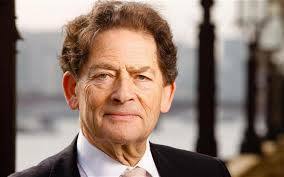 Lord Lawson, who led the Conservative campaign for Brexit, said that political correctness was a ‘great blight of our age’, adding that students often have their way because of ‘totally supine’ university authorities. “At an event to celebrate the 40th anniversary of the University of Buckingham, the UK’s first private university, he added, ‘This is happening throughout the universities today, where it is pushed by students. They may not be the majority of students, but they are very vocal and they have their way because of totally supine university authorities. 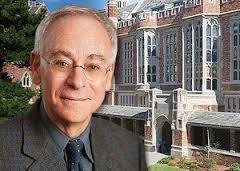 The suppression of freedom of speech in the universities is now one of the great problems of our time’. A new higher education bill has been criticized by academics, who say universities will be forced to pander to the demands of ‘snowflake’ students. I agree with Lord Lawson. There is entirely too much exclusion of what for some is painful dialogue on university campuses. One example is at my alma mater where the name of a college (my particular college, in fact) was changed because of student protests. The name of the college was Calhoun College, named for John C Calhoun (March 18, 1782 – March 31, 1850) who was an American statesman and political theorist from South Carolina and the seventh Viced President of the US from 1825 to 1832. He was also a two-term US Senator and US Secretary of State.He is remembered for strongly defending slavery and for advancing the concept of minority rights in politics, which he did in the context of defending Southern values from perceived Northern threats. While I can appreciate that Calhoun is an objectionable figure for many, is it necessary to expunge him from history? It seems to me that particularly at university level, one needs to reflect on the good and the bad. One needs to ask, “Why did they name this college after John C Calhoun? Would we do the same today? Why not? How have we changed?” It seems to me that there are some learning experiences in such a dialogue. Besides, when one starts cleaning up names, where does one stop? Calhoun College (now called Grace Murray Hopper College) is part of Yale University. Founded in 1701, it was originally the Collegiate School of Connecticut, but it became Yale College after the gift of Elihu Yale, a slave trader. “A Cambridge college has removed a David Irving book from display in its library after a visiting Jewish academic complained. Churchill College, Cambridge, said the Irving’s biography of its namesake, Winston Churchill , would now be held in a ‘closed access’ area with borrowers only able to read it on request. I had a look on Amazon where there are plenty of David Irving’s books. His book, Churchill’s War, The Struggle for Power, has nine five-star reviews and one three-star review. The 3-star review complains about non-delivery of half of the e-book. The five-star reviews focus on the depth of research and the quality of historical writing. Many of the reviews mention Irving’s reputation, but say that this work is not biased. Non governmental organisations should be free to exclude material which they consider objectionable. The government should not have any such freedom. Amazon ought to be transparent about it’s policies, which should err in favour of exclusion of objectionable material. Any policy should be intelligent and selective, leaving ‘on the shelf’ quality, constructive books by objectionable authors. For most of us it probably seems unlikely that freedom of the press could disappear in the UK – that the government will control what the press can publish, or that publishers will be afraid to run exposés of politicians and other public figures. But that is exactly what could happen when the government’s consultation regarding the implementation of Section 40 of the Crime and Courts Act, 2013 ends next Tuesday. The Crime and Courts Act, 2013 is a result of the Levenson Inquiry after the phone-hacking scandal that put the News of the World out of business. Section 40, a part of the statute that was never implemented, would require that every newspaper not signed up to regulation by Impress would pay all costs in any libel case brought against it, even if it won the case. So, for example, if a major newspaper ran an exposé of an MP involved in a money for votes scandal, the newspaper would have to pay all of the MP’s legal expenses, no matter the outcome. Impress is funded by Max Mosley, a barrister and former racing driver with interests in Formula One and other automotive organisations. He is the son of Sir Oswald Mosley, the former leader of the British Union of Fascists. In 2008, his sexual exploits were exposed by News of the World. He sued and won, not on the basis that the reported exploits didn’t happen, but on the basis that they were falsely described as being fascist. Mr Mosley funds Impress to the extent of £3.8 million, and says he may continue funding for years. Impress is the only media regulator to have won the backing of Press Regulation Panel, which has been set up with a royal charter, introducing a degree of government involvement. About 50 media outlets have signed up to be regulated by Impress. The other media regulator is IPSO, the Independent Press Standards Organisation, with over 2,500 members, IPSO does not submit to the Press Regulation Panel, and is governed by the media industry. IPSO has an Editor’s Code of Practice, they can levy fines of up to £1 million, they can force publication of corrections, there is a 24-hour anti-harassment hotline, a whistle-blower’s hotline, they can investigate complaints and require their members to submit annual reports of compliance with the Editor’s Code and how they have handled complaints. This is a regulator with professional due process and teeth! Mr Mosley suggests that requiring a media defendant to pay all legal expenses is an incentive to arbitrate disputes. He is disingenuous. A new horde of ambulance-chasing lawyers will certainly appear, attracted by the high fees to file ‘no-win-no-fee’ lawsuits. Why would they be interested in arbitration? He says that Impress will screen out frivolous law suits. Really? You may be asking why I, as a writer, am interested in this issue. 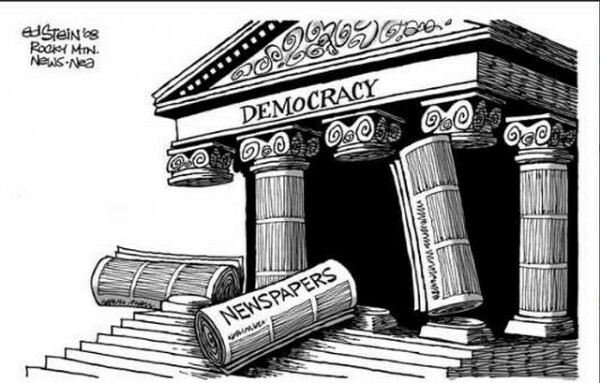 The answer is that I care greatly about the preservation of our democracy, and history has taught me that once laws are passed to regulate the press, it is not long before other freedoms of expression are regulated or discouraged. If you agree with me, and if the government decides to put Section 40 to a vote in Parliament, please make the case for a ‘NO!’ with your MP. As you may know the first amendment to the US Constitution covers free speech. There is an article in my alumni magazine which addresses the ‘First Amendment Problem’. You will know that freedom of speech is, to me as an author, a key issue. The article says that hate speech isn’t the issue; politics isn’t the issue; the problem, says the dean of Yale Law School, is that nobody knows how to think about free speech. The article says,” Take Sorrell v. IMS Health. In 2007, Vermont passed a law restricting the sale of doctors’ prescriptions to drug companies, which were using the records in their marketing. The drug companies, along with data mining companies sued, saying that the law violated their First Amendment rights. Vermont argued that the law regulated commerce, not speech. The case reached the US Supreme Court, where Justice Anthony Kennedy delivered the majority opinion in 2011. Marketing, he reasoned, consists of speech. Therefore, singling out marketers amounts to government censorship. An interesting example is that some dentists believe that the mercury contained in some dental fillings can leach into the body, but they are punished by their professional regulators for malpractice if they advise their patients to remove the fillings. The same dentists can, without censure, write op-ed pieces setting out their views. This latter case is ‘public discourse’ and has First Amendment protection, while advice to a patient is not ‘public discourse’. I decided to read this novel by Salman Rushdie because I had not read any of his work, because this particular novel is famous, and because of my interest in better understanding Islam. The novel is famous for the fatwa issued by the Ayatollah Khomeini calling for the death of Rushdie for having committed blasphemy and for mocking the Islamic faith. There was a bounty of £2.8 million on Rushdie’s head and several failed assassination attempts; others associated with the novel were not as fortunate: Hitoshi Igarashi the Japanese translator, was stabbed to death on 11 July 1991, and a number of attempts were made on the lives of others. The novel was published in 1988, and it was shortlisted for the Booker Prize, but won the Whitbread Award for novel of the year. The fatwa was issued on 14 February 1989. In the UK, 13 Muslim barristers drafted an indictment for the High Court attempting to justify a charge of blasphemy. This attempt failed and blasphemy is no longer an offense under English law. For years, Rushdie lived at no fixed abode under Special Branch protection. In 1998, Iran issued a conciliatory statement and Rushdie declared he would no longer live in hiding. The Iranian state news agency reported in 2006 that the fatwa would remain in place permanently since fatwas can only be rescinded by the person who first issued them, and Khomeini had since died. 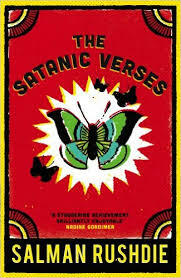 In the context of blasphemy, it is worth a brief description of the origin of the term ‘satanic verses’. Muhammad was living in Mecca at the time and he was experiencing difficulty persuading powerful Meccans to accept that he was the prophet of God. There is a theory – repeated in Rushdie’s novel – that, as a concession to these men, he gave brief permission for prayer to three popular idols. What is certain is that Muhammad originally recited several verses naming the idols, praising them and indicating that they should not be neglected. Muhammad then inserted three replacement verses which say that the idols are only ‘names’ and that ‘God revealed no authority for them’. His explanation for the change was that Satan had managed to slip in the verses without him knowing it. In the novel, Muhammad (called Mahound) comes across as a weak, indecisive individual who uses religion for his own benefit. But the sequences in the novel involving Mahound are contained in the dreams of the character, Gibreel Farishta, who is mentally ill and who believes that he has become the archangel Gabriel, so these characterisations cannot be said to represent the author’s personal views. The central plot of the novel is that two Indian Muslim actors fall from the sky over the English Channel when the flight they are on is blown up. Miraculously, they both survive, and they take on the personalities of the archangel Gabriel (Gibreel Farista) and the devil (Saladin Chamcha). Each of them has difficulty being accepted in London, each finds to a prior love, and each returns to his previous occupation. Chamcha seeks revenge on Farista for having deserted him after their fall from the sky, and he stokes Farista’s pathological jealousy, destroying his love relationship. Farista realises what his colleague has done and he forgives him. Nonetheless, Farista kills his lover, Alleluia Cone, and commits suicide. Chamcha returns to India and is reconciled to his dying father. The novel – at 547 pages – has a great deal beyond this simple plot, including dream sequences involving the prophet Mahound. There are also sequences involving relationships of the primary characters with lovers, friends and acquaintances. This is not an easy book to read. The sentences are long, sometimes complex, and the references to characters, places and things unfamiliar. There is one sentence 146 words long. Being somewhat familiar with Islamic history, I recognised some to the dream characters, but I could have benefited from a working knowledge of Indian mythology. It is also not easy to follow what is going on: is this part of a dream or reality? Having said that, I did find much of the writing uniquely engaging. The feelings one encounters in reading the book are doubt bordering on hopelessness with some offsetting glimpses of humour. The doubt has to do with the purpose of life, religion, acceptance as an individual, and perception vs reality. As a writer, I am not involved in categories 1 & 2, but I can’t resist commenting on each of them. Regarding Category 1, the usual objection by a governmental body to disclosure of information is: ‘The public don’t need to know’ or some similar excuse. In my experience, the real reason is; ‘We’ll be embarrassed if that is disclosed’. To which my response would be: “All the more reason to disclose it!” I believe that the only legitimate reason not to disclose the requested information is ‘national security’. Not infrequently, the body will protest that disclosure represents a financial burden. If this is actually the case (reams of information, much photocopying, etc), I believe the requesting party should reimburse the costs (but only the costs – no discouragement fees). Category 2 has been in the news lately with some individuals obtaining court orders prohibiting the media from publicizing acts (usually sexual) which they don’t want ‘people’ (read their wives) knowing, or about which they feel embarrassed. I have no sympathy whatsoever for these individuals. The appropriate remedy for these problems is not to prohibit their disclosure but to avoid creating them in the first place.